“Only if we flap our arms very hard” is not the answer to this question. For the most part, Amish abstain from flying, though certain groups of Amish do permit it. Also, most Amish do allow air travel in extraordinary situations. Amish objections to air travel are mainly based in the idea that air travel is not considered essential. Amish do make allowances for other forms of travel out of a recognition of a need to journey further than a horse-and-buggy allows. This may include visiting family in other settlements, sometimes out-of-state, or on business purposes. Air travel may help a person arrive at a destination faster, but a car, bus, or other vehicle will get one there just the same. Air travel is also expensive, symbolic of a fast-paced lifestyle, and connected with luxury and worldliness in the minds of many Amish. Air travel typically requires photo identification, another hurdle, as most Amish object to posed photography. While most Amish allow travel by other means, for instance as passengers in cars, trains, buses, and boats, air travel is a form of transportation generally prohibited by Amish. New Order Amish churches, comprising around 3% of all Amish, represent one exception to the stricture against air travel. One New Order Amishman, before having children, flew regularly in his previous employment. Another New Order Amishman had no issue taking a business/vacation trip with his wife to Washington D.C. New Order Amish, among the most permissive of Amish affiliations when it comes to technology, tend to take a softer line on air travel, and flying is generally allowed in most congregations. Regardless of affiliation, most Amish permit flying in emergencies. 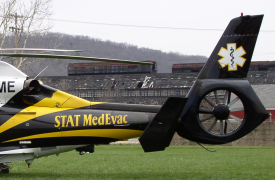 This comes into play most often when accidents require rapid transport, often by helicopter, to distant hospitals. An Indiana Amishman described how his young son was transported to a hospital in Michigan after a serious buggy accident. Amish consider the well-being of church members in their approach to technology. Nodding to practicality, most Amish see value in flying in emergency situations, though they nearly universally refuse to sanction it for business or personal purposes. 13 responses to Can Amish fly? This is really interesting! I’ve always wondered about this but never really thought to ask any of my Amish friends about it. One couple drove all the way to Mexico (cheaper dentures there I guess) with a hired driver, I wondered if it wouldn’t have been cheaper just to fly! Thanks for the info. Are you a Plain Quaker, Rachel? Amish people in Vientiane / Laos? I saw a group of Amish people doing sightseeing in Vientiane, the capitol of Laos. exists there a community of Amish people or what could be the reason they have been there? Lisa, I was told by a New Order Amish woman that they are allowed to fly but Old Order are not-and it is not always easy to tell the difference by appearance so most likely they were New Order Amish (or another very plain sect). your answer is that what I already knew. Maybe somebody else know something about Amish people in Laos. I`ve been there at the beginning of February this year. I don’t know about Laos but my son, Mark, was in China during the month of October. Yes, he flew. Most New Order Amish may travel by air. So, if you saw an Amishman on the Great Wall of China or in the Forbidden City, it may have been Mark! thank you very much for your reply, Don. It was a group of Amish people with two women, three men and a lot of children and it looked very strange because they wore their Amish outfit. By-the-way, the old mileage counter clicked over, again, on November 24th. I turned 92. Funny. I don’t feel a day over 88. It’s funny this thread reactivated yesterday and today of all days…I am currently in Washington Dulles airport, having unexpectedly spent the night here last night (well, in a hotel) when a flight was cancelled due to “mechanical failure”. I will get to Poland somehow, but a trip like this makes you wonder if the Amish aren’t wise to reject air travel 😉 At least the airport has wi-fi. Adding to the above, New Order Amish do travel by air. I don’t know anything specifically about Laos, but I do know someone who did relief work in the southeast Asia, Indonesia I believe. Thanks for sharing that Lisa. Christmas in Poland, eh Erik. I hope it will be lovely and not hugely large amounts of snow as I recall hearing last year or the year before (or a couple of years ago when we had a Polish born PSW come to our place to help with certain things around my parents). I would imagine if they wanted to settle in a different part of the world aside from the Americas they would resort to air travel if needed. Happy Birthday Don! May you be blessed with many more! Have a safe trip, Erik, and I hope you have a great time in Poland! Thank you Gayle and Shom. I made it in last night about 48 hours after my journey began. Never had a trip so “eventful”. The best part was after the first flight was canceled and everyone ended up having to spend the night in DC, the airline found me a final connecting flight with another airline that it turns out they had no agreement with (so in other words, that connection was worthless since I couldn’t get on the plane without buying a new ticket). Though I didn’t find that important piece of info out until I had already flown from DC to Amsterdam. There was also a strike going on with Lufthansa in Germany, but somehow I managed to dodge that and get to Poland via Frankfurt in the end (4 flights total). Some people had it worse, especially those who missed connecting flights to destinations in Africa that only have flights every 2-3 days. There are bigger problems to have, and as long as the thing lands in the end, I can’t do too much complaining. Leave a reply to Can Amish fly?